You'll be £10.00 closer to your next £10.00 credit when you purchase Marshal Ney At Quatre Bras. What's this? Fought on 16 June 1815, two days before the Battle of Waterloo, the Battle of Quatre Bras has been described as a tactical Anglo-allied victory, but a French strategic victory. The French Marshal Ney was given command of the left wing of Napoleon’s army and ordered to seize the vital crossroads at Quatre Bras, as the prelude to an advance on Brussels. The crossroads was of strategic importance because the side which controlled it could move south-eastward along the Nivelles-Namur road. Yet the normally bold and dynamic Ney was uncharacteristically cautious. As a result, by the time he mounted a full-scale attack upon the Allied troops holding Quatre Bras, the Duke of Wellington had been able to concentrate enough strength to hold the crossroads. Ney’s failure at Quatre Bras had disastrous consequences for Napoleon, whose divided army was not able to reunite in time to face Wellington at Waterloo. This revelatory study of the Waterloo campaign draws primarily on French archival sources, and previously unpublished French accounts, to present a balanced view of a battle normally seen only from the British or Anglo-Allied perspective. Paul Dawson is a well-known Napoleonic specialist who has produced a number of essential books on the cavalry of the period. In this book he looks at the performance of Marshal Ney not only at Quatre Bras but also during the French pursuit on 17th June and at the Battle of Waterloo on 18 June. The book shows the battle of Quatre Bras in all of its details and changes of fortune from French to Allied throughout the battle. The charge of Kellermann's Cuirassiers is explained by the author to be not as suicidal as is sometimes written about. The book comes with a one page colored map of the battle, and seven pages of colored photos of the different places on the battlefield today. This interesting study of the campaign draws primarily on French archival sources and previously unpublished French accounts to present a balanced view of a battle normally seen only from the British or Anglo-Allied perspective. Do we need another book about Waterloo? If they are like this we most certainly do. This book is different because of the primary source material researched to create it. The usual story is not trotted out without a fresh critical analysis. Within the book one chapter stands above all others for me and that is chapter 8. The movements of 1st Corps is a tale of mismanagement and confusion and has been a source of conjecture for all who study Quatre Bras. Paul Dawson makes, as clear as possible, the events of the day carefully weighing the evidence for the ultimate actions of the key players. He makes the confusion clear while bewailing the fact that verbal exchanges which could have played an important part on the day are lost to history. This is a book for the Waterloo 'aficionado' written in a way which is easily accessible to the general reader. 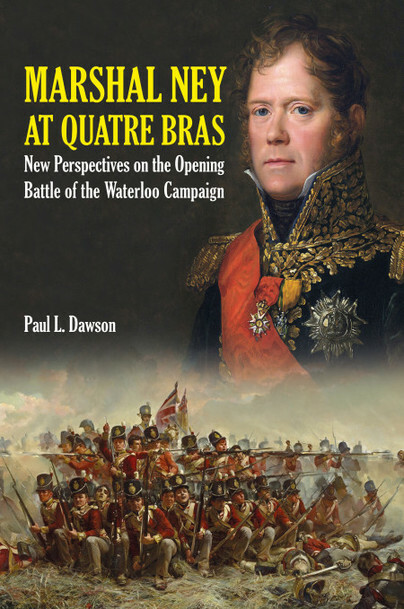 I highly recommend this book and at the time of writing look forward to, the soon to be published, Paul Dawson's 'Waterloo. The Truth at Last'. Paul L. Dawson BSc Hons MA MIFA FINS, is a historian and author, specialising in the French Army of the Napoleonic War. In addition, as a noted equestrian, this allows him to have a greater understanding of what was and what was not possible for cavalry and other troops which utilised horses. Working as a historical tailor producing museum-quality replica clothing gives him a unique insight into construction techniques of the period, as well the knowledge and ability to decipher documents from the period.